Bayer's Stivarga has become the first new therapy to be approved for hepatocellular carcinoma (HCC) in almost a decade in the EU, giving patients a second-line option for treatment. The European Medicines Agency (EMA) approved oral multikinase inhibitor Stivarga (regorafenib) for patients with HCC who have been treated first-line with Bayer's older drug Nexavar (sorafenib), matching the drug's approval in the US in April and Japan in June. "Nexavar is the only approved first-line treatment and Stivarga the only approved second-line therapy in Europe and the US for patients with HCC," said Bayer in a statement. HCC is the most common form of liver cancer, which is often more difficult to treat than other cancers with an annual mortality rate of 48,000 in the EU. The green light is a big boost for the product which has been wrestling with tough competition in one of its other approved indications - colorectal cancer and gastrointestinal stromal tumours (GIST) - and saw sales shrink 12% to €275m in 2016, with a 20%-plus in the US. The US approval of the drug for HCC has already had an impact, with turnover of Stivarga in the first half of the year reaching €158m, up 18% with US sales advancing 25% to €85m. Bayer also says that a short-term effect of competition from Taiho's Lonsurf (trifluridine and tipiracil) - which is safer but less efficacious - has started to recede. Stivarga is the first and only treatment that has demonstrated a significant improvement in overall survival (OS) in second-line HCC, hitting the mark in the phase III RESORCE trial. Bayer's drug extended OS in patients who had progressed despite Nexavar therapy from 7.8 months to 10.6 months, equivalent to a 37% reduction in the risk of death over the trial period. "Until now, there was no effective second-line systemic treatment option for liver cancer patients and their treating physicians in Europe," said RESORCE lead investigator Jordi Bruix of the University of Barcelona in Spain. "With the EU approval of Stivarga in HCC, the outlook could significantly improve for patients with HCC, as they have now for the first time, a treatment plan with two approved therapies involving the use of Stivarga directly after Nexavar." Stivarga is a key component among a new generation of pharma products - along with cancer drug Xofigo (radium-223 dichloride), anticoagulant Xarelto (rivaroxaban), ophthalmic therapy Eylea (aflibercept) and pulmonary arterial hypertension (PAH) therapy Adempas (riociguat) - that Bayer needs to drive its pharma unit as it digests Monsanto - bought for $66bn last September. It is eyeing €10bn in sales from the group at peak. 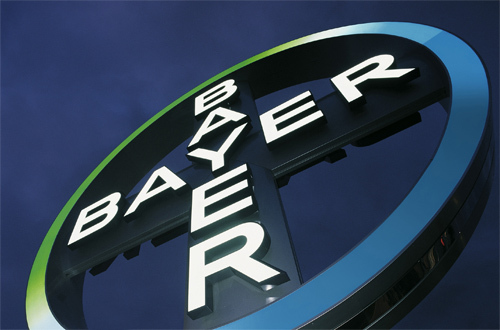 Meanwhile Bayer is also carrying out studies aimed at moving Stivarga upstream in colorectal cancer, with a trial (ARGO) due to report results next year looking at the drug as an adjuvant to surgery.